Cost to install an interior staircase varies greatly by region (and even by zip code). Get free estimates from stair contractors in your city. Cost to install an interior staircase varies greatly by region (and even by zip code). How much does it cost to install an interior staircase? For this discussion, we will look at the costs and requirements of installing a straight, but decorative, staircase in the central interior area of an average home. This staircase, however, will have a "return" which means that a small platform is included in the schematics and costs. Can the installation of pre-built stairs such as this be considered a DIY project? Realistically, an experienced homeowner could save around $1000 in installation costs by tackling the job on their own, though it is an absolute necessity to have a second person (or even two additional helpers) for such a job as this. Most of the pre-built staircases rely on basic tools such as drills, levels, and hammers for the installation process, but the complexity of a job with a double set of stairs, such as the set discussed here, might benefit from the knowledge of a qualified professional. Carpenters - the homeowner might keep costs low by handling demolition on their own, though they will have to discuss this with their carpenter or contractor ahead of time. A pair of carpenters will require around 8 hours to install a set of pre-made stairs using the steel stringers 3 supplied with most such products, and also adding all rails and balusters 2. With an average market rate of $45 per hour, the work will cost at least $720. It is important to ensure that they follow all local building codes and are insured, licensed, and qualified for such an important project. Purchase - a single set of pre-made stairs is going to average from $800 and $1000, and this project requires two sets for a total of roughly $1600 to $2000. There are also costly freight and delivery charges that must be added into the budget as well, and these tend to average between $300 and $600. Most pre-built interior stairs will come in the desired finish, such as staining or painting, but the homeowner will also have to consider the use of any moldings too. The average costs of simple quarter-round stock along with any baseboards will average between $250 and $400. Many homeowners opt to use a spiral kit staircase that relies on steel instead of wood. These are far less expensive and cost between $400 to $1500, though there are structural considerations with their use. There are also combination kits which rely on metal framing and wooden treads, and which are available for prices ranging between $1500 to $5000, depending upon the design. 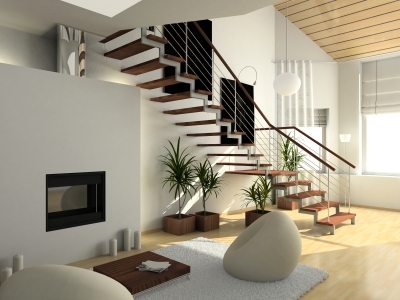 How much does it cost to install an interior staircase in my city? Cost to install an interior staircase varies greatly by region (and even by zip code). To get free estimates from local contractors, please indicate yours. An inclined structure used to support the treads and risers in a staircase. Cost Considerations: Steel stringer prices are based on horizontal run length. A 4-step stringer costs approximately $200 while a 10-step stringer costs roughly $600. Pre-made stairs often come equipped with steel stringers.